The Moto Guzzi Nevada is twenty years old! Celebrating this milestone is the “Anniversario”, a new sports custom joining the highly popular and widely acclaimed Classic. 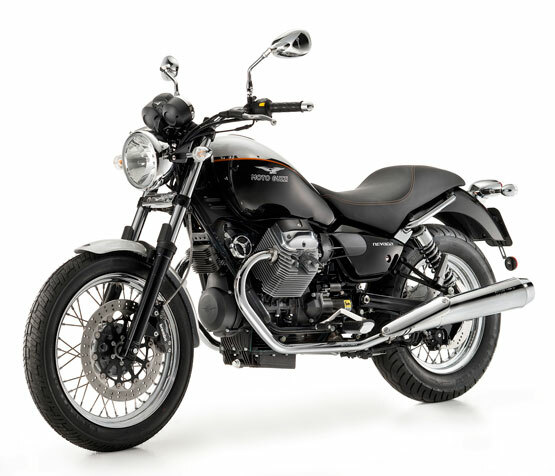 The history of Moto Guzzi is made up of the intertwined individual stories of many different man and motorcycles, and one of the most successful chapters in this history has been written by the Nevada. 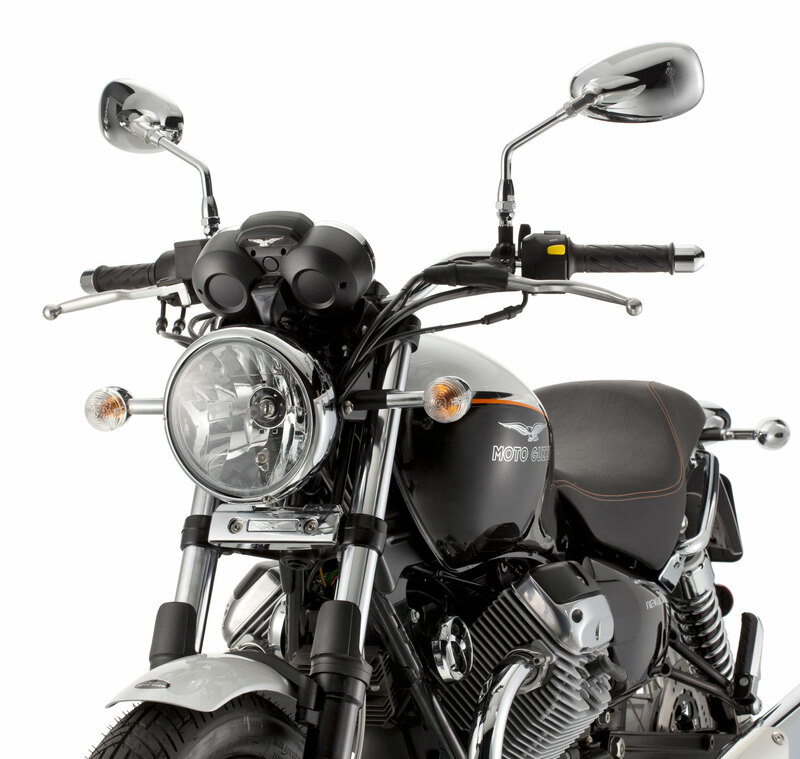 A bike which, year after year, continues to assert itself as a worthy alternative to the American custom, with its retrained style, a bold mechanical personality and impeccable handling, in keeping with the finest Moto Guzzi traditions. The eclectic and reliable Nevada Classic boasts the enviable distinction of being the bike that single-handedly inspired thousands to either take up or return to motorcycling, converting them into die-hard fans of the Eagle brand. This remarkable feat is thanks to its ability to reconcile performance and costs within the reach of a broad cross-section of the market, with the image and technology of a more expensive bike. 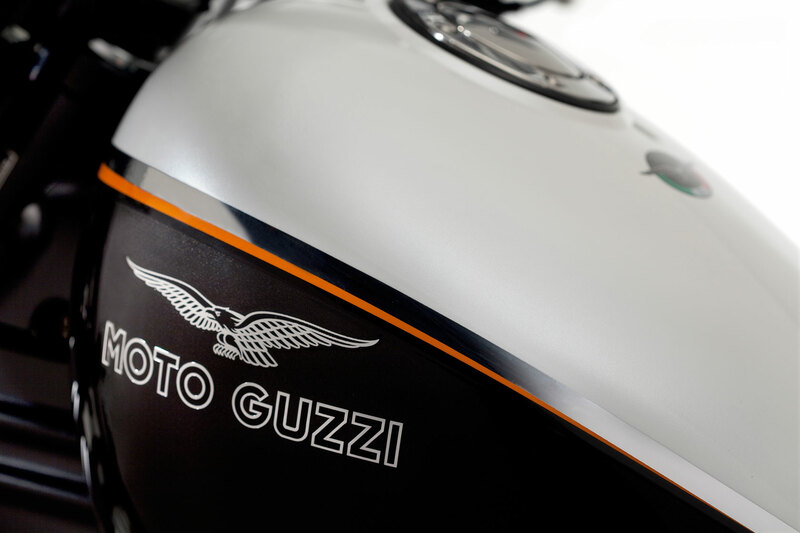 This perfect balance of image and content has been taken a step further in the new Moto Guzzi Nevada Anniversario. Created to celebrate the twentieth anniversary of the mid-sized custom from Mandello, the Anniversario joins range alongside the timeless Classic to offer the choice of a bike with more eye-catching, contemporary looks. 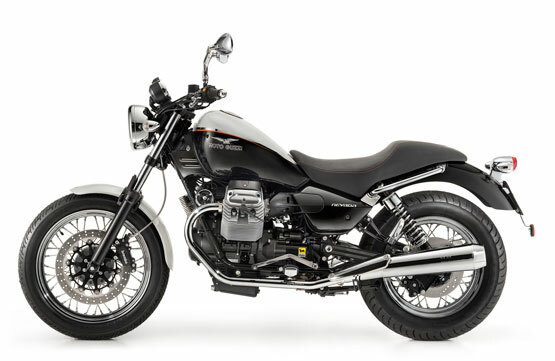 Conceived to express a sportier, more dynamic concept of style, the latest addition to the Guzzi family is more muscular and more of rebel than the Classic. The new two-up saddle seems perched on top of the fat rear tyre, with the wheel-hugging two-tone rear mudguard sprouting out from behind, while the mudguard itself sports an all new chrome plated taillight. Completing the revised looks of the tail is a set of brand new chrome plated grab handles – yet another styling touch distinguishing the bike from the original Classic. The design of the centre section of the Anniversario showcases the beating heart of the bike – the legendary small block transverse 90° V-twin. To further show off this sculpture in metal, the side fairings have been redesigned to complement the forms of the 14 litre tank. The tank itself seems suspended over the V of the two opposed cylinders in a visual effect created by the two-tone colour scheme, with black dominating the lower part of the bike from the sump upwards, and white the predominant colour of the upper area consisting of the top of the tank and the mudguards, with a delicate orange pinstripe separating the two areas. 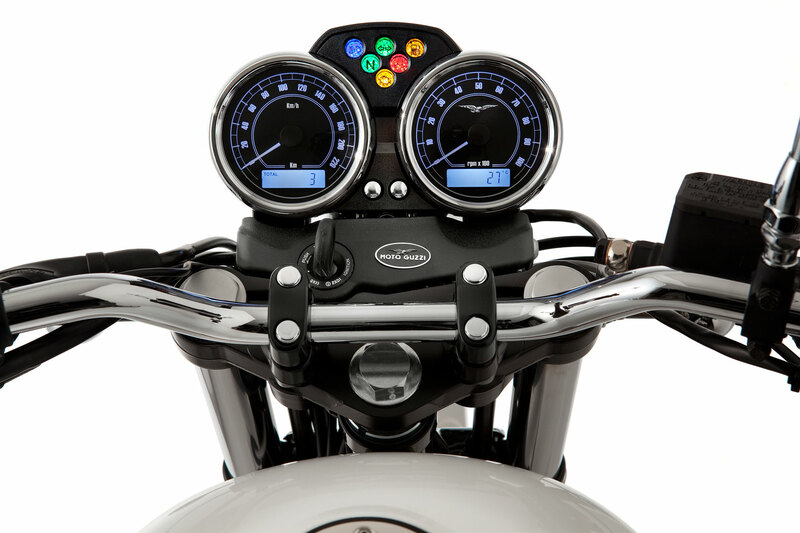 The result is a bike with distinctly sporty looks that further emphasised by the low bar handlebars which, in keeping with the spirit of the bike, are lower and narrower than the bars on the Classic. Technically, the Nevada Anniversario retains the same chassis architecture and offers the same performance as the Classic. The frame uses an utterly dependable double cradle layout, with bolt-on, removable lower elements. Defining the perfect steering geometry was a priority, and the result is a headstock rake angle (27°50′) specifically tailored for stability and directional precision. Comfort is guaranteed by quality suspension components. At the front is a Marzocchi fork with 40 mm stanchions and 130 mm wheel travel, while at the rear is a swingarm linked to two shock absorbers featuring adjustable spring preload and offering 118 mm of wheel travel. The brake system consists of a 320 mm floating front disc and a 260 mm rear disc. Other standout features are the wire wheels, measuring 18 inches at the front and 16 at the rear to cater for high profile tyres, for outstanding agility and superlative feel. The small block twin cylinder engine is the latest evolution of an engine originally created in 1977 that has since earned legendary status for its reliability and economy. With a bore and stroke of 80 and 74 mm respectively, the 744 cc unit features aluminium alloy cylinders and pistons with a special wear-resistant graphite coating. Fed by a Weber Marelli electronic fuel injection system and breathing though 36 mm diameter throttle bodies, the engine combines remarkably low emissions with a feisty temperament in keeping with the spirit of the Nevada, with an impressive maximum torque of 54.7 Nm at just 3600 rpm. Once in the saddle of the Nevada Anniversario, you immediately feel that you’re riding a light, compact and nimble bike, with an instant sensation of control. This impression is further emphasised by the new saddle and handlebar configuration, resulting in a bike that is not just great looking, but fantastic to ride, too. Only one colour scheme is offered, although the bike may be personalised to suit your own individual tastes and needs by choosing from the comprehensive Moto Guzzi accessory catalogue. Accessories : rear carrier, side bags, engine guard.